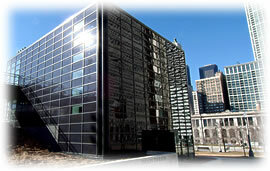 The northeast Exelon Pavilion on Randolph Street provides public access to the Millennium Park Garage elevator and the Joan W. and Irving B. Harris Theater Terrace. 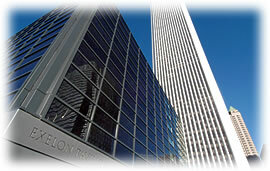 The northwest Exelon Pavilion is the Millennium Park’s Official Visitors Center, and is noted as the “Exelon Visitors Center” on all of Millennium Park’s maps. The northwest pavilion will house offices of the Chicago Park District, provide elevator access to underground parking, and be a venue for special exhibitions on energy, park events and other themes. Designed by Hammond Beeby Rupert Ainge Architects, the two, black-glazed minimalist towers will integrate solar electric (photovoltaic, or PV) modules on the outside surfaces. With a combined area of 6000 square feet each pavilion will utilize 34.5 kilowatts from 459, 75-watt modules custom made by Spire Solar Chicago. For each pavilion, the projected electrical output is approximately 16,175 kilowatt-hours per year, which is expected to meet 17% of the electrical requirements.